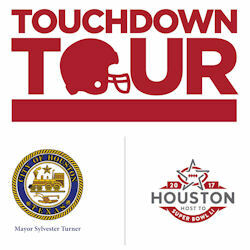 October 4, 2016 -- In partnership with Mayor Turner and the City of Houston, the Houston Super Bowl Host Committee announced a slate of upcoming event dates on Tuesday for the one-of-a-kind fan experience: the Touchdown Tour. The first of the 11 dates will be held on October 8, at Mason Park, located at 75th Street and Tipps. The Touchdown Tour, designed to bring the excitement of the Super Bowl to the Houston area as the region prepares to Houston Super Bowl LI in February, will feature interactive games, a Houston Texans mobile locker room, special photo booths, giveaways, music and more. Food and beverage will be available for purchase. On both Friday and Saturday, the Host Committee will also engage the community through a combination of its Touchdown Houston legacy initiatives regarding education health and community enhancement. Selected community parks will host the Touchdown Tour dates with the exception of the November 19th date which will take place at Kingwood High School. “The Houston Super Bowl Host Committee and the City of Houston are committed to giving all residents an unparalleled Super Bowl experience,” Sallie Sargent, the President and CEO of the Houston Super Bowl Host Committee, said. “We want to bring the excitement of Super Bowl LI into the community, and Mayor Turner and the City of Houston have been instrumental in turning this vision into a reality.” The Touchdown Tour’s kickoff event was held August 27 at the nonprofit science and space learning center, Space Center Houston followed by a stop at Joint Base San Antonio. For more information, visit the Houston Super Bowl Host Committee’s website: www.housuperbowl.com and follow the Houston Super Bowl Host Committee on Facebook, Twitter and Instagram or visit www.houstonspecialevents.org. The Houston Super Bowl Host Committee is the centralized planning entity for Super Bowl LI, and acts as the liaison between the NFL, City of Houston, Harris County and the local community. The Host Committee is a private, non-profit 501(c) (6) Texas Corporation, and is responsible Super Bowl LI festivities and logistics including Business Connect, the Host Committee’s charitable arm, Touchdown Houston, and the volunteer program.